The crowd roars as the sound of the drums beating and flutes whistling in the stands spreads across the stadium. 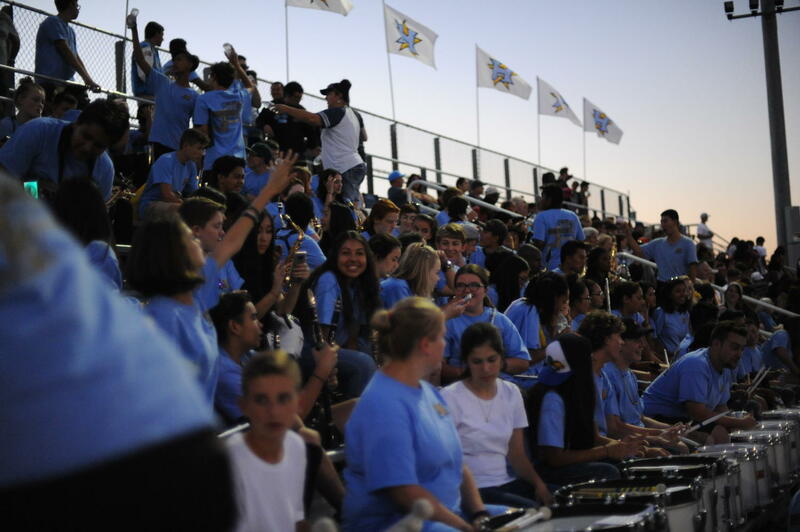 With their catchy tunes and spirit from head to toe, the Heritage High School Pep Band is mainly responsible for the smiles on everyone’s faces and constant dancing in the student section. Every single year Mr. Ernest, the band teacher at Heritage, recruits students from a majority of his classes to play in the stands during the infamous football season. These consist of his Wind Ensemble and Symphonic classes with a mix of hand-selected freshman joined in the band. The pep band is also accompanied by the Drumline, which is directed and ran by Mr. Carreon. This year, the football season began on the 17th of August, which was drastically early compared to previous years. This caused the band leaders to rush to get the music out to the rest of the musicians and get practicing and memorizing the pieces as soon as possible. ”We didn’t get as much time to practice as much as last year so the crowd doesn’t feel the energy like they used to,” said Doriana Le (11) about the matter. Multiple class period were dedicated to perfecting articulations and notes. This was especially critical for the sophomores along a couple of the freshman since this was the first year of Pep Band for a majority of them. “It wasn’t as difficult to learn the pieces because I previously got them from playing at graduation,” claimed Melina Rodriguez (10). The pieces that the musicians play during pep band season are remarkably different compared to the ones they usually play for concerts. Concert pieces are usually very intricate with scales and multiple time signatures embedded in the composition. On the contrary, the pep band songs consist of pop melodies heard on the radio with repetitive phrases. “My favorite pep band song is most definitely Feeling Myself because everyone knows it,” exclaimed Sandra Pleitez (10). The pep band season is a favorite for everyone around because it is a time for musicians to bond and other students around the school to get a taste of what their music program has to offer.